In the simplest of definitions, an X-ray is a quick, painless test that produces images of the structures inside your body. And it’s particularly useful in identifying the shape and status of your bones. More technically speaking, an x-ray is a noninvasive medical test or procedure that can help physicians diagnose and treat medical conditions. X-rays are the oldest and most frequently used form of medical imaging. X-Rays themselves are a form of radiation, much like visible light or radio waves. However unlike light or radio waves, X-rays can pass through most objects including our bodies. X-rays expose you to small doses of radiation, but most scientists and doctors will agree that the benefits from these tests far outweigh the risks. In a health care facility, an X-ray machine can send individual x-ray particles, called photons, in a precise or carefully aimed manner at parts of our bodies and record an image of what is inside of us. These photons pass through our bodies and hit a special digital image recording plate for a computer or special film behind the part being x-rayed. Until recently, x-ray images were always taken and viewed on a hard film copy, kind of like a photographic negative. But today, most x-ray images are digital files that are much more easily accessible, handled and shared if necessary. X-ray image technology has grown incredibly precise since their inception but to this day they are still mostly black and white with many shades of grey. Different parts of the body let different amounts of the protons pass through them based on the density of the material they are made of. For instance, the dense bones in a person’s body doesn’t let as many protons through and thus appear white on the x-ray image. Any metal in a person’s body would hardly let any protons pass and come out very white on the x-ray as well. Soft tissues inside your body, however, will vary the amounts and show up as various shades of grey. These might include muscle, fat and fluids inside of you and a radiologist is trained to carefully distinquish between them. Air, having hardly any density, will let protons pass easily and thus shows up on an x-ray as black. For some types of X-rays, a contrast medium such as iodine or barium is carefully put into a person’s body to provide specific details on an X-ray. These contrasts appear extremely white in comparison. So while a fluid such as blood may be grey and hard to decipher by itself, when a contrast is introduced into the flow, the size and path of the arteries that carry it may become many times more clear to study. An X-ray may be performed at a number of places - in a hospital radiology department or ER, in a health care provider's office or clinic, a dentist’s office or even a Chiropractor’s office. There's even mobile x-ray machines that can be taken just about anywhere. 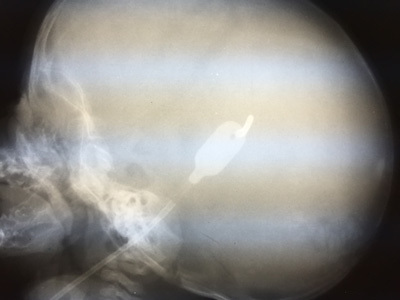 Basically, an X-ray can be taken in any safe environment is done correctly by an x-ray technologist. With the right equipment, a technologist will position the patient, x-ray machine, and film depends on the type of study and area of interest. And multiple individual views may be taken if requested. If you think of an X-ray like a photograph, and in a way it is, too much motion can cause the final image to be blurry. So patients receiving an X-ray are often requested to hold their breath and stay as still as possible during the brief exposure. Usually this is only about one second for the actual image to be taken. X-rays get their name from a German physicist named Wilhelm Konrad von Röntgen who first noticed the glow caused by these photons and, not knowing what to call them, named them ‘X-rays’. When the discovery became famous, many people called them Röntgen Rays, but eventually the term X-ray stuck. Röntgen was said to have also taken the very first X-ray of his wife's hand. Many things in space actually emit X-rays, including black holes, neutron stars, binary star systems, supernova remnants, the Sun and even some comets. Scientists and physicians now days often call X-rays or the science of X-rays radiographs or radiology, so feel free to impress people with that term anytime in the future. 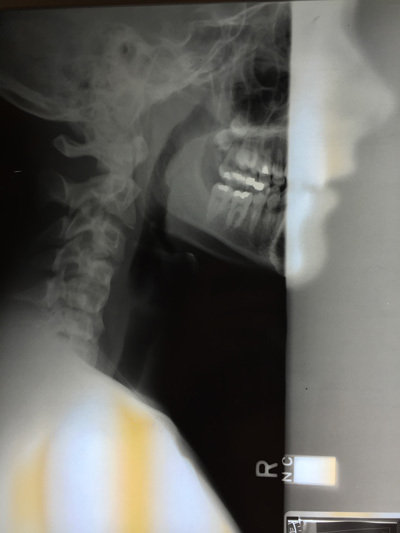 ABOVE: X-ray of neck and jaw. 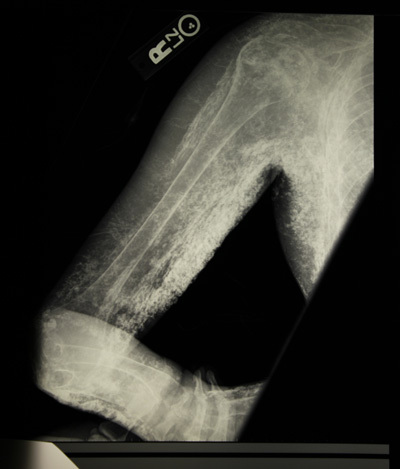 ABOVE: X-ray of arm and elbow. ABOVE: This animation is actually a series of x-rays that have been put together to form a simulated motion. Doctors and Radiologists do not view x-rays in this manner. You should not expect to view your x-rays like this.